All these chains are equipped with the AFAM Xs Ring. Its shape reduces friction and keeps the grease longtime inside the chain which guarantees a longer lubrication and increases its longevity. The shape of the Xs-Rings increase the flexibility of the chain, reduces friction and therefor improves your transmission. AFAM 520XLR2 is a basic chain equipped with Xs-rings for use on road and off road bikes from 125 to 400cc. AFAM 428XMR-G / 520XMR2 / 525XMR2 / 530XMR2 are reinforced chains with Xs-rings for engines up to 650 cc and street use. AFAM 520XRR2-G is a reinforced gold color chain with Xs-rings for off-road use. These Xs rings are specially designed to resist wear through sand and mud in order to maintain the flexibility of the chain. The roller diameter has been adapted for off-road use to cope better with sand and mud without tensioning the chain. 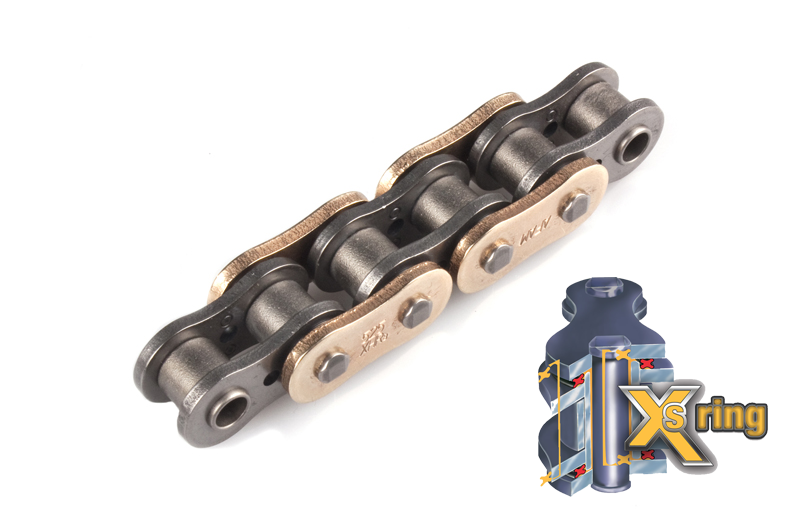 AFAM 525XRR / 530XRR are reinforced chains with Xs-rings. Improved types of steel and heat treatment make it possible to build a narrower chain with sufficient tensile strength and fatigue resistance. AFAM 520XSR-G / 525XSR2-G / 530XSR2-G are super reinforced gold color Xs-ring chains. A likewise lighter built chain with an increased tensile strength and fatigue resistance. A flexible chain that is ideal for any sports bike. AFAM 520XHR2-G / 525XHR3-G / 530XHR2-G his hyper reinforced gold color Xs-ring chain with a very high tensile strength and fatigue resistance. The customized shape of the Xs-rings keeps the grease longer inside the chain making it the ideal chain for an heavy touring motorcycle.